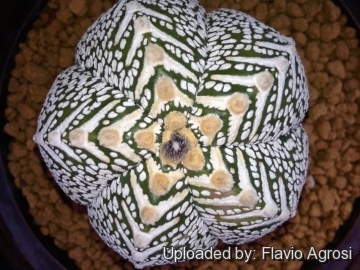 Description: This peculiar plant is the result of crossbreeding between the two most famous astrophytum cultivars ♀Astrophytum myriostigma cv. 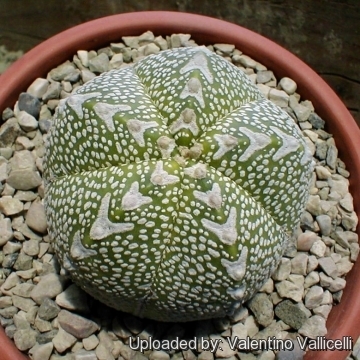 Onzuka and ♂Astrophytum asterias cv. Superkabuto and shows some interesting intermediate features of both the parents. In F1 cactus hybrids the plants usually show a body shape similar to that of the mother plant and an intermediate mix of other characters. The superb feature of of this hybrid is due to the intersection between the traits of the ancestors. 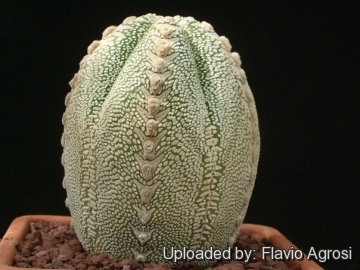 Many of them have inherited by Astrophytum myriostigma cv. Onzuka the 5 fairly sharp ribs and by the Astrophytum asterias cv. Superkabuto the large white dots, and often these hybrids shows fly or V shaped patterns around the areoles. The flowers are also very beautiful. 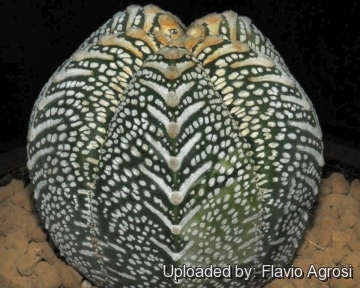 This is one of the best, but very difficult to obtain, hybrids, because all the varieties of Astrophytum asterias usually fail to interbreed with Astrophytum myriostigma. It is very rare and beautiful. 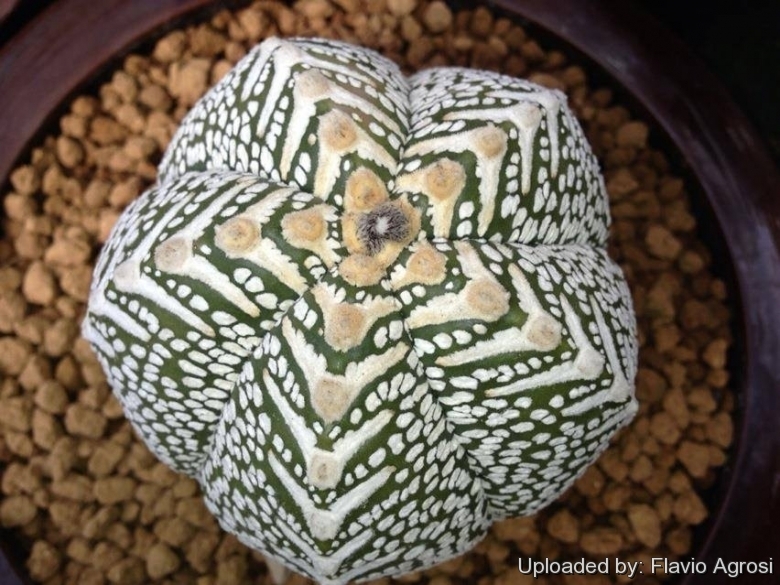 Remarks: Compare with the inverse hybrid Astrophytum hybrid AS-ONZ (A. asterias x A. myriostigma cv. Onzuka) which is similar but with (usually) 8 ribs. 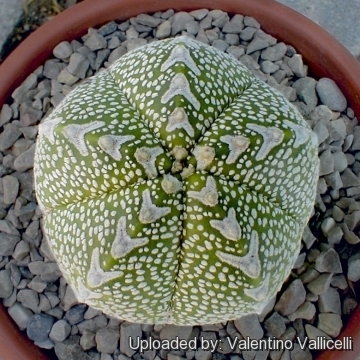 See also: Astrophytum hybrid ONZ-AS (A. myriostigma cv. Onzuka x A. asterias) and Astrophytum hybrid ONZ-SK variegated & albinos (A. myriostigma cv. Onzuka x A. asterias cv. Superkabuto). 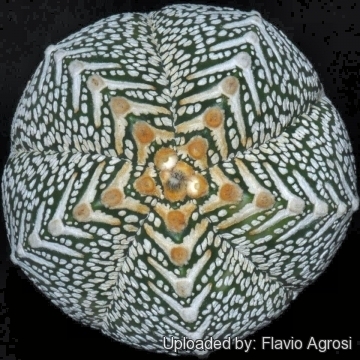 Cultivation and Propagation: The hybrid Astrophytum hybrid ONZ-SK V type (A. myriostigma cv. Onzuka x A. asterias cv. Superkabuto)is not too difficult in a greenhouse, although grows quite slowly. The plants need a loose well-drained mineral soil. They need a good amount of light. Watering can be done weekly during summertime, if the weather is sunny enough, with a little fertilizer added. Kept this way, plants will show a healthy, although slow growth. They are frost hardy to -4° (-10°) C.